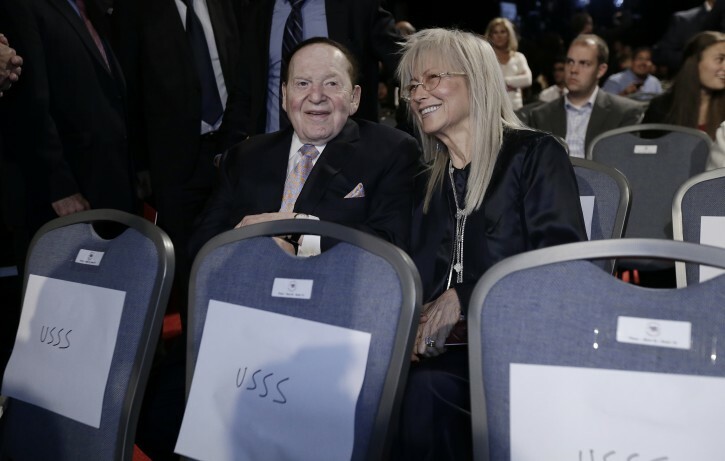 Washington - Sheldon and Miriam Adelson were among the the major donors to Republican candidates who watched the midterm election returns with President Donald Trump at the White House. Other Jewish donors who joined Trump on Tuesday night in the East Room were billionaire investor Steve Schwarzman, co-founder and CEO of the Blackstone Group; investor Michael Milken; and Dan Gilbert, majority owner of the Cleveland Cavaliers, Bloomberg News reported. Trump did not give a speech or deliver any remarks, according to the report, which also said that guests ate pizza, mini hot dogs, hamburgers and French fries served from elegant dishware. The Adelsons poured more than $100 million into this federal election cycle, including to the Congressional Leadership Fund, a super PAC allied with outgoing House Speaker Paul Ryan, R-Wis., and the Senate Leadership Fund, which has close ties to Sen. Mitch McConnell, R-Ky., the majority leader. The Republican bid to keep control of the House was a bust, with Democrats winning control after eight years. Trump-backed Republicans won seats in the Senate. Adelson, however, saw a Senate race in which he was invested go down, one close to home: Sen. Dean Heller, Nevada’s incumbent Republican, lost to Jacky Rosen, a Jewish congresswoman. Adelson also packed two major Florida races, for U.S. governor and senator. His choices in both cases, Rick Scott for the Senate and Ron DeSantis for the governor, have declared victory, but the margins in both cases are so narrow, both races are likely to go to an automatic recount. Sheldon Adelson, a major giver to Jewish and pro-Israel causes, was among the biggest givers to Trump’s presidential campaign and his inauguration. For an "anti-semite", he sure keeps company with a lot of Jews. Perhaps we can put that lie to rest.